Forget boring white pastries and towering iced creations. This latest wedding cake trend is cutting edge. 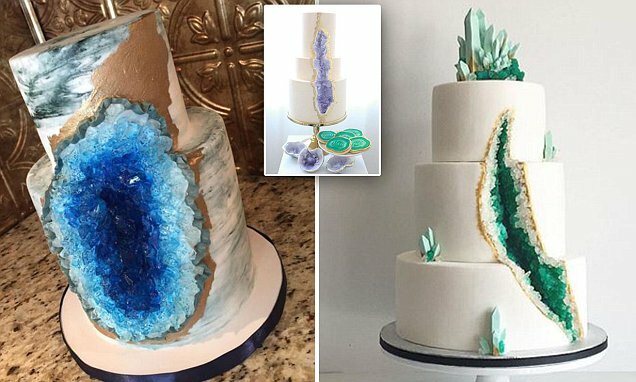 Geode wedding cakes, which use colourful sugar rocks to create intricate crystal formations inside a frosted cake, are the latest beautiful sweet to pop up all over Instagram and Pinterest. At present, there are more than 500 geode cakes filled with what-look-like crystals on Instagram, while countless bakeries have fallen over themselves to re-create the style first made popular by Australian pastry chefs. For those of you who might need a refresher about what exactly a geode is, geodes are volcanic rock creations that look like normal rocks until they are split open to reveal a sparkling crystal interior. The cakes recreate this idea in dessert form. While they look like regular wedding cakes on the outside, when sliced apart, it soon becomes clear that the custom-made wedding centrepieces are actually tasty works of art. As long as they don't make plans for something that might not happen. a clear conscience is usually disputed. They look like my brother. Probably charged an arm and a leg. Try reading the article you'll see that they're SUGAR crystals that even you can chew.